This is the the easiest Hanukkah cupcake ever — the trick is finding the blue and white sprinkles shaped like Stars of David. I got mine at Kake Kreations, a Southern California cake supply shop that does mail order. 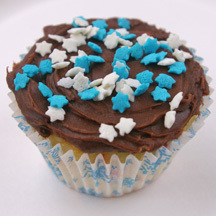 What You Need: 1 cupcake; chocolate frosting; Star of David sprinkles. How to Make It: Frost cupcake. Sprinkle with Hanukkah sprinkles! This entry was posted on Wednesday, December 16th, 2009 at 3:08 pm	and is filed under Hanukkah cupcakes. You can follow any responses to this entry through the RSS 2.0 feed. Responses are currently closed, but you can trackback from your own site.